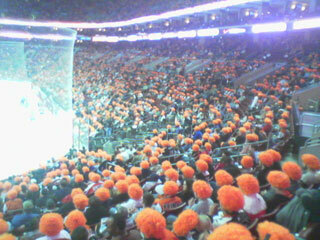 Thousands of Philadelphia Flyers fans don orange wigs given out before the game in an attempt to set a Guinness World Record for “the most people wearing wigs at a single sporting event” during the Flyers hockey game against the Chicago Blackhawks [on] Monday, Oct. 30, 2006, in Philadelphia. The public address announcer said the record was broken. Wait a minute! 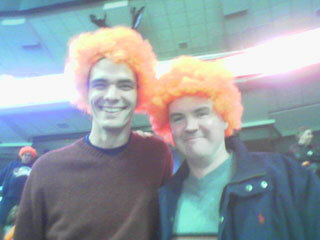 I’m getting so carried away by all of the wig-related tomfoolery that I’ve nearly forgotten to mention the game. Despite the Flyers’ early-season struggles (a dismal record of 2–7–1 over their first 10 games), they defeated the Chicago Blackhawks, 3–0. Peter Forsberg scored twice, Robert Esche had 26 saves, and Chicago suffered its third shutout in a row. A good night all around — thanks, Todd! Stop wearing a cell-phone headset in your ear all day long, regardless of whether you’re on a call or not. You look self-important and stupid. Stop placing the table of contents in a magazine on page 45. I understand that advertising pays your bills, but I shouldn’t have to thumb through a dozen perfume-scented ads to determine the page number of a specific article. Stop referring to 9/11 as “nine-one-one.” That’s a phone number, actually. My parents, my sister Meg, and I left for State College on Friday morning, which is a great way to beat the traffic, enjoy a long lunch, and finish a lot of shopping before most of the crowds even arrive in town (as though I really need any more PSU stuff). There’s nothing like having a Rolling Rock with your dad (along with dozens of fellow alumni) at the Rathskeller on a Friday afternoon. Before the homecoming parade began, a young female student warned a nearby older alumnus (who was sporting a long white handlebar mustache and a Class of 1957 button) that her sorority had claimed the entire surrounding area of the sidewalk, even though the man didn’t pose a threat to anyone’s view. My dad stepped in to say a few choice words, and the girl quickly backed down. In front of 108,112 fans on a chilly afternoon, the Nittany Lions picked up about half as many total yards and first downs as Illinois, but made enough plays on defense and special teams to escape with a 26–12 victory. During his postgame press conference, Joe Paterno described the offense’s performance as “lousy,” and he was absolutely right. As we enjoyed breakfast at the Waffle Shop on Sunday morning, we discovered that we were seated two tables away from none other than Penn State linebacker Paul Posluszny, who had recorded an impressive 13 tackles during the previous day’s game. My grandmother makes whoopie pies. (Insert joke there.) But she calls them goobers, which is just as funny. Now I’m confused. I thought goobers were chocolate-covered peanuts. When you have a cholesterol and blood pressure screening scheduled for a Wednesday morning, it’s best to be mindful of that appointment on Tuesday night and order something healthier than a bacon cheeseburger and fries during a round of Quizzo with your friends at a Philly pub. The results? Blood pressure: pretty good. Cholesterol: marginal at best, and significantly higher than in the past. After a few months of slacking on diet and exercise, I think it’s definitely time to get back on that health kick from last year. According to the U.S. Census Bureau, our fine country reached a total population of 300 million people at exactly 7:46 a.m. today. 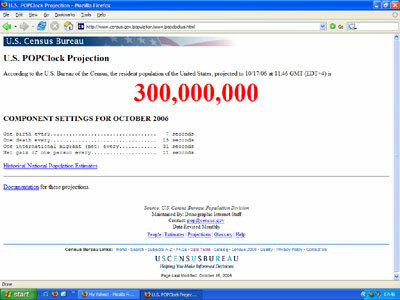 However, I’m very skeptical that the actual population figure was anywhere close to 300 million this morning. For one thing, we really have no idea how many illegal aliens are crossing our porous borders each day. So the total number of Americans — I mean, the number of people staying here, at least for now — could already be well over 305 million, for all we know. And remember, this is a government agency that’s providing that nice, round number, and the U.S. government isn’t all that great when it comes to statistical forecasts — poor weather predictions and unreliable budget forecasts certainly come to mind. Many years ago, a poor Scottish farmer saved a young boy from drowning in a bog. The boy’s father, a nobleman, arrived at the farm the next day to reward the farmer for his good deed, but the farmer refused payment. The nobleman insisted on providing for the education of the farmer’s son. That boy grew up to be a doctor — specifically, Sir Alexander Fleming, who discovered penicillin. Years after Fleming’s breakthrough, the nobleman’s grown son came down with pneumonia, and his life was saved by penicillin. That cured patient was none other than Sir Winston Churchill. Great story, huh? Just one minor problem: it’s a hoax. The storyteller admitted that she wasn’t sure whether to believe the story or not, especially because she had first read the tale in an e-mailed chain letter. But she passed it on anyway, simply because “it’s such a good story,” regardless of the story’s historical accuracy. After at least 15 years on the market, e-mail software needs to get much smarter. If someone tries to forward a message that contains keywords related to a known hoax, the software should prevent that message from being distributed. That kind of feature, perhaps a joint venture with a well-known debunker of urban legends such as snopes.com, could save millions of dollars of wasted bandwidth and thousands of hours reading (and forwarding) tall tales. An entire software industry was built around identifying and blocking harmful viruses. Why should we treat hoaxes any differently? You might be on to something. If you and some buddies could develop the “anti-hoax” software, soon people would be demanding it be included with their AOL or anti-virus software. We could build it and sell out to one of those guys (or Microsoft) and make a mint! Google buys anything and everything. They might want it too! Thanks for your vote of confidence, Steve. This is indeed one of very few entrepreneurial ideas of mine that might actually work. But, of course, now anyone can find this idea via Google and steal it from me. Earlier today, a New York Times article reminded me of a fascinating bit of college football trivia. It’s a story that never ceases to amaze me. On Oct. 7, 1916, exactly 90 years ago this past Saturday, Georgia Tech defeated Cumberland College (of Lebanon, Tenn.) in the most lopsided college football game ever played. The final score, believe it or not, was 222–0. Neither team recorded a first down. Georgia Tech never needed one before each of their scores, and Cumberland didn’t gain 10 yards on any possession. Georgia Tech didn’t pass the ball once. Instead, they rushed for 978 yards (over half a mile!) and held Cumberland to just 14 passing yards and −42 rushing yards. In case you’re wondering, Penn State has had its share of lopsided defeats — and victories, too. According to its official history page, Penn State suffered its worst loss in a crushing 106–0 defeat against Lehigh in 1889. On the other end of the spectrum, Penn State destroyed Lebanon Valley, 109–7, in 1920 for its largest win of all time. Boo-hoo, George. Try waiting 13 years since your last playoff appearance and 26 years since your last (and only!) championship. Get some perspective and stop your insufferable whining. But I take some solace from the fact that an obscene payroll, especially one that has totaled nearly $1 billion over the last six seasons without a single title, isn’t a guaranteed formula for success after all. So, after a cruel, gut-wrenching championship drought of six years, the Yankees are somehow due? I couldn’t have summarized the Yankees’ sense of entitlement better myself. I liked the fact that you credited the source for the Yankees statistics, but didn’t bother to do so for the Phillies numbers. The sad thing is that the Phils have to spend a little, or maybe a lot, in order to not stumble at the end like this the last two years. If my team got eliminated on the final weekend TWO years in a row, I’d be screaming for changes. Unfortunately, the Phils seem to act like a small-market team most of the time, so I can’t see them spending their way into the playoffs. And there’s no shame in that; look at the Mets. They opened the vault for Beltran, Delgado, and Pedro, and they’re still playing. Well said, Larry. It certainly seems as though the Phillies’ management lacks the motivation to field a championship-caliber team. In fact, I’m starting to wonder whether the owners are actually aiming for a break-even point somewhere between empty seats in the stadium and a long-overdue playoff run. But then again, the Phillies had the fourth-highest payroll in 2005 — they’re starting to open their wallets, but it’s still not enough. OK, I get it. You’re both running for Congress, hoping to represent Pennsylvania’s Sixth District. Election Day is just a month away, and the polls indicate that it’s going to be a close race. Do either of you really want my support? Here’s the deal: I’ll vote for the first one who stops leaving recorded messages on my answering machine every other day. 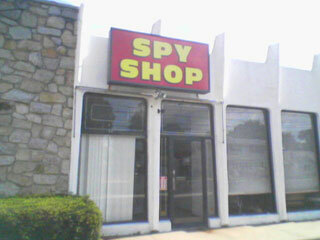 If you’re in the business of selling espionage-related products, wouldn’t you want a less conspicuous sign?